ATTENTION: Split System AC! Reservations after 11/1/19 will get to enjoy it! Both bedrooms cooled! Very, Very Nice...MAUI OCEAN FRONT DELUXE 2 BEDROOM 2 BATH CONDO RETREAT(sleeps 6) AT THE ISLAND SANDS RESORT OCEANFRONT a short stroll to the longest beach on Maui! 'Hale Nalu' home of tranquility MEETING YOUR EVERY EXPECTATION! Arrive happy...leave happier! 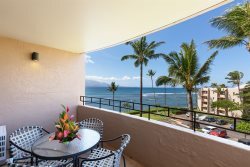 DIRECT OCEANFRONT A peaceful view of the breathtaking Maalaea Bay, the grand volcano Haleakala and the sparkling Kihei lights at night. Relax and enjoy the very best we have to offer... Soothing sights & sounds of the ocean from your living room, master bedroom and lanai, washer & dryer, convenient elevator to the 5th floor master king size bed, guest room with two full size beds. One of the best things about this place is that the bedrooms are completely private (no screen or loft) allowing for social areas to be enjoyed 24/7! air conditioning, free wireless Internet, dvd, cable, fresh tropical flowers, comfy modern decor, a more than well stocked & updated kitchen with 'sub zero refrigerator' upgraded towels and sheets, large shady private lanai, pool, bbq, pool side lounges, beach chairs, beach umbrella, beach towels, binoculars for whale watching, cooler for your excursions, free on site parking and your very own personal concierge. Loved it!! Great place and location! Picture perfect views from the lanai are amazing and you can watch whales, turtles, and seals.We loved it here it was an absaloutly breath taking experience. The whole island was so welcoming and proud of their beautiful culture. We will definitely be coming back to enjoy this paradise. This condo is exactly as advertised. There are 2 lanais overlooking the ocean and the view is absolutely spectacular! Falling asleep to the sound of the waves crashing the shore every evening (or when napping) was one of my favorite things. The condo is well kept and very clean. It's a very quiet and peaceful community and we were mindful of that. I highly recommend this condo for 4-6 people. One bedroom sleeps 4 and the other sleeps 2. Loved it and would rent it again. Aloha! Very Comfortable and Conveniently Located. Our weeks stay was awesome. We loved this condo for its comfort and convenience to everything on the Island. All the comforts of home were provided. We successfully watched every sunrise and sunset from the lanai. We explored the west side of Maui easily as Maalaea sits right in the middle. A short drive south brings you to Kihei and Waimea; while headed north brings you to Lahaina and Kaanapoli and Napili. We took advantage of Maalaea Harbor for its dining, shops and also excursion cruises. When we come to Maui again, I hope to book this same condo. We absolutely loved our time here. Very much enjoyed our stay. We had a great time. The condo had everything we needed. Would highly recommend staying here. FANTASTIC Ocean View. If you rent it just for the view, it is worth it. The condo was great as well and had great beach anemities. The close proximity was perfect for the snorkeling tour and we felt we were well located for seeing the rest of the island. A great holiday experience. We liked this spacious condo so much, we booked it again.